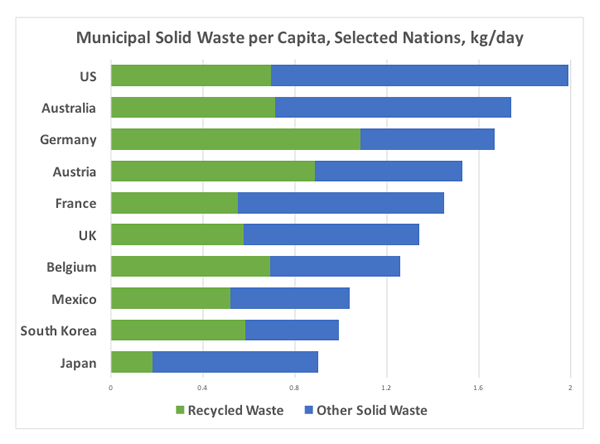 With growing global population and urbanization comes more waste; governments, companies hunt for sustainable solutions. The developed world is drowning in garbage with rising consumerism. Global urbanization and a swelling middle class contribute to higher volumes of waste and increasing costs due to regulations. Few communities have tolerance for landfills or toxic fumes associated with incinerators, and developing countries are no longer willing to serve as dumping grounds. Seeking to reduce costs of waste management, governments promote recycling and impose regulations at every stage from production to packaging. Sustainability and reducing waste of a growing population remains a priority for governments and multinational organizations like the United Nations and the Organization for Economic Co-operation and Development. Confronting growing awareness of the challenges of huge stockpiles of waste, researchers develop new technologies, working with entrepreneurs and designers to transform waste into new products which are then sold back to consumers. Plastic bottles are pulverized to become soft fleece jackets. Glycerin from biodiesel fuel production is fed to farm animals. Animal waste is heated and sterilized, then shaped into pellets for use as fertilizer or animal feed. Electric impulses separate contaminants to purify wastewater. Architectural firms use old tires, drums and pallets for playground equipment and decks. Blast furnace slag in Japan is sold for making cement, and recycled plastics are used to make ammonia. Swedes burn garbage for energy, and other nations invest in facilities that heat sewage sludge to kill bacteria before compressing the material into bricks for construction. Studies suggests that shoppers respond positively to labels touting recycled goods or packaging. A 2015 Nielsen global survey on corporate social responsibility reported that 66 percent of global online consumers across 60 countries expressed willingness to pay more for sustainable goods from companies committed to positive social and environmental impact: Respondents earning $20,000 or less expressed more willingness to pay for such goods than those earning $50,000 and more. Likewise, respondents in the Middle East, Africa, Asia and Latin America expressed greater willingness to pay more for such goods than consumers in North America and Europe. Food: Governments have targeted food waste since the World Bank suggested in 2014 that about one third of all food produced for human consumption is lost or wasted. France became the first country to ban retailers form disposing of expired food products, and Italy followed suit. Both countries lifted barriers on redistribution to encourage donations and composting, and many stores around the world already sell items near the expiration date to discount stores. The European Union encourages markets and restaurants to use ingredients nearing their expiration date in prepared meals and to apply new dates for products not yet spoiled. The United States does not prohibit markets or restaurants from using ingredients beyond their expiration date for prepared dishes. Walmart has worked with US regulators to end the practice of tossing out an entire carton of eggs if just one egg is broken. The company sends flawed fruit to jam suppliers, and also funds research on turning food waste into animal feed and compost. Excrement: The World Health Organization points to the “win-win” opportunities of managing animal waste for fertilizer, fuel, building materials and animal feed. Waste from pigs, cows and other animals are used as fertilizer for non-vegetable crops. The World Health Organization has issued guidelines on treating human waste for use in agriculture and aquaculture: “The ancient practice of applying human excreta to the land has maintained soil fertility in many countries of Eastern Asia and the Western Pacific for over 4000 years, and remains the only agricultural use option in areas without sewerage facilities.” The document notes that most of the world yield of farmed fish comes from ponds fertilized with human and animal waste, and WHO also offers a manual on safe practices. Pilot projects are also underway to use human waste for energy. Industrial and Hazardous Waste: Singapore, with limited land, tracks hazardous waste, banning some substances and encouraging reliance on those that can be recycled. Industries regularly reuse chemicals like sulfuric acid, ammonia and more, and Singapore’s National Environment Agency organizes exchanges of spent acids, solvents, oil and other materials. With a drought in California, farms are permitted to use wastewater from oil drilling operations to irrigate pistachio, almond and other water-hungry crops. Textiles: A goal for the nonprofit Council for Textile Recycling is to eliminate textile waste to landfills by 2037. New secondary markets are opening for recycled cotton. An international consortium of 200 companies collects used clothing and textiles to sort and grade them: 45 percent is reused as apparel; 30 percent as industrial wiping or polishing cloths; and 20 percent for sound-proofing, carpet pads and furniture stuffing while 5 percent is unusable. Environmentalists resist fast-fashion trends by frequenting secondhand stores and choosing clothing that won’t quickly go out of style. Recycled clothing is a $1 billion industry worldwide, according to the Association for Secondary Materials and Recycled Textiles. Plastics: Product development can outpace regulation, and some problems are apparent only after a product becomes popular. In the 1990s manufacturers began inserting microbeads made of polyethylene – the most common plastic and the most valuable for recycling purposes – into cosmetics, soaps and personal care products. A decade later fishermen realized that the beads entered lakes and streams after passing through drains and water treatment systems. Canada, the United States and Europe took steps to ban rinse-off products containing microbeads. Many companies have voluntarily phased out production and are replacing the small beads with natural substitutes like pulverized nutshells, an agricultural waste byproduct. The circular economy, turning trash into treasure, promises innovation and sustainability. Consumers appreciate recycling, reuse and other ways to protect the environment, but they also expect to be treated as partners – fully informed through adequate labeling, regulatory and safety reviews, and education campaigns. *Susan Froetschel is managing editor of YaleGlobal Online. She is the author of five mystery novels that examine globalization and public policies at the local level.